It's time to ditch your heavy winter coats for fresh spring style! I've put together some basic items (many of which you'll probably already have) to take you right through the warmer season with minimum hassle. The weather is unpredictable, so a colourful cardi is great for keeping warm on chillier days. A blazer is also essential, and I love this one because it can be worn either smart or casual, and goes with pretty much anything! Wide leg jeans or a long skirt are staples whatever the weather. White wide leg trousers (or white skirt if you prefer) are great for keeping cool - wear with colourful shirtdresses and tunics. Neutral accessories can be worn with many outfits, though a bright coloured bag is a fun addition for this season. And of course, don't forget your matching hijabs! 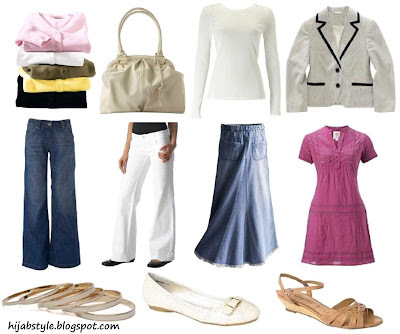 Now you have the basics of your wardrobe, you can easily incorporate items from this season's trends to complete, e.g. chunky tribal jewellery, a floral maxi dress or ombre patent shoes! Cardigans £9.90 each, Bonprix; bone half moon bag £30; white long sleeve top £7; white blazer £40; wide leg jeans £25, all Dorothy Perkins; white wide leg trousers £35, Promod; long denim skirt £35, La Redoute; organic shirt dress £10, New Look; enamel bangles £14, Urban Outfitters; white buckle flats £7; sandals £12, both New Look. very cute, I love the sandals! and I have a purse just like that - but it's from Urban. all in all good post (: transition tiiime. ymiss, New Look are having an amazing sale right now, loads of shirtdresses for just £10! Thanks for the tips. Some of my spring/summer basics are a white shirt, some skirts and plain colour scarves. I find these very practical. Silvia - thanks for reminding me, I need to find a new white shirt!